The goal of the campaign was to help Postilion’s financial institution clients increase enrollment of Internet Banking and Bill Pay services. The campaign featured compelling research stats on the environmental benefits of Internet Banking over traditional banking, plus offeres a $2,500 sweepstakes. 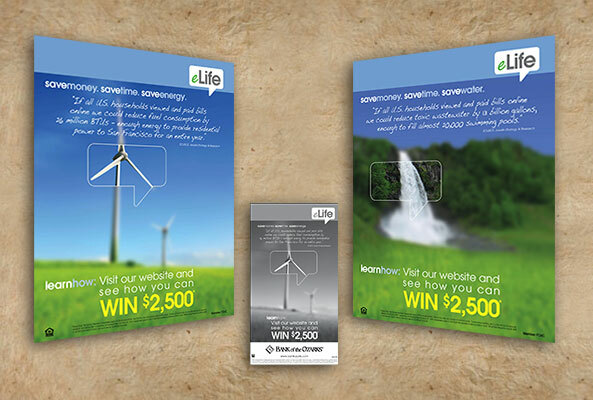 The campaign consists of a branch poster, self mailer, postcard mailer, statement stuffers, counter card, print ad, and a point-of-purchase display with rack brochures. The eLife campaign received the highest adoption rate, doubling our previous successful campaign enrollment numbers.